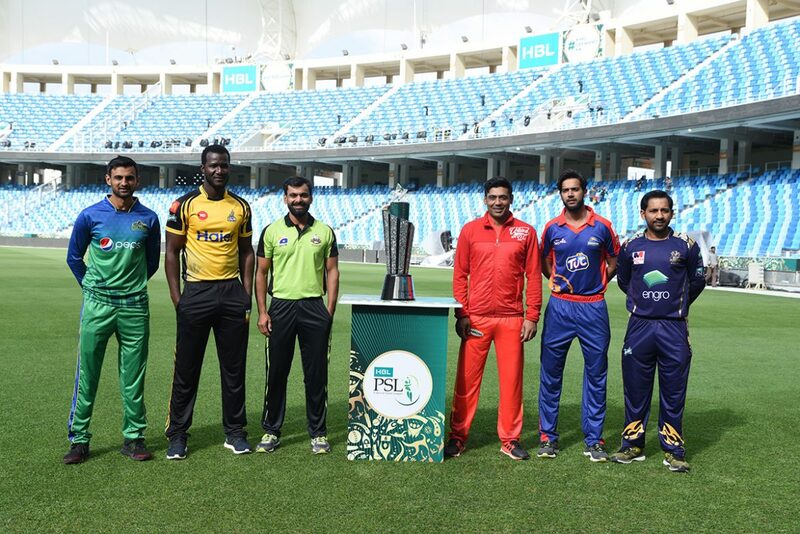 Dubai, February 12: The HBL Pakistan Super League 2019 trophy was unveiled at a crowded press conference at the Dubai International Stadium, the venue where the tournament would kick-start on Thursday with a glittering opening ceremony followed by the opening match between defending champions Islamabad United and Lahore Qalandars. Chairman Pakistan Cricket Board Ehsan Mani, Chief Marketing Officer HBL Naveed Asghar, Professionals Director Commercial for Middle East and Africa Mr Arsalan Saif representing Swarovski were joined by the captains of the six franchises at the trophy launch press conference. “The HBL PSL 2019 is set to provide incredible excitement to cricket fans all around the world; we thank our sponsors, partners, the six franchises and all stakeholders who have contributed in putting together this cricket extravaganza. We look forward to seeing a competitive tournament with a galaxy of international and Pakistan stars showcasing their talent.” said Ehsan Mani. Captain of the HBL PSL 2017 champions Daren Sammy said, “All six teams are very balanced and that is good because we will get to see quality cricket in HBL PSL once again. The star, the crescent, the green and the white! This year’s HBL PSL Trophy is a visual representation of the Pakistani flag in all its sparkling beauty. The central core, covered in Swarovski’s 16 faceted Xirius crystals one by one rises up as a dazzling green beam and shows off the majestic Shooting Star at the pinnacle. Around the star, six pillars covered on the sides with Swarovski’s Fine Rocks, open to make a crescent, depicting the six participating teams of the HBL PSL. More than 50,000 crystals have been used in the trophy that took 4 months to be made, from concept to creation. ‘The Pakistan Trophy’ celebrates the different cultures in Pakistan and the harmony with which they stand together to call this country home. The green and white unite the many colours of this land under one flag, each colour being vivid as it is. The people of this land join together to form the sparkling the star and crescent, the people join together to form a strong Pakistan. HBL PSL is driven by this diversity and celebrates the best of Pakistan’s cricketing talent with the people of Pakistan.